Digital channels are the primary way to start consumer and business engagements by providing accessibility to a global audience and a cost-effective means to conduct business. In recent years, mobile devices became the preferred way in which consumers, business partners, and employees interact with companies and each other. The of mobile users sets the expectation that information is at their fingertips whenever they require it. Increasingly, this information must be the right information, delivered in context, and almost certainly drawn from multiple sources to enhance the mobile user’s experience. 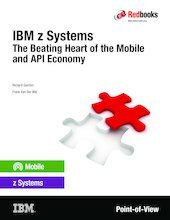 This IBM Redbooks® Point-of-View publication gives a perspective on the role of IBM z Systems™ platforms as a powerful contributor in the API economy. In this paper, we describe the technology enablers that allow traditional mainframe environments to be used as a set of RESTful business services and participate as a provider of contemporary mobile and cloud-based services. Modern APIs and enterprises: Friend or foe?